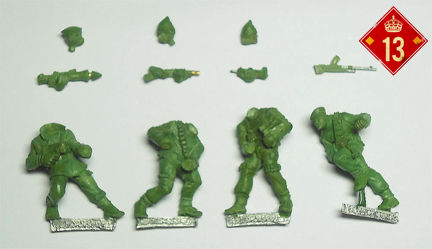 We got the pre-release pack of the new Incursion MI-13 Commando miniatures. The MI-13 are the new British special forces unit for Incursion. As with all Grindhouse Games’ minis they arrived quickly and were crisply cast with almost no flash. The unit consists of 7 complete models: 2x Gut-Gunner, 1x Grenadier, 1x Paddy Mayne, 2x Commando, and 1x Corporal. Except for Paddy all the units have separate heads so you can mix and match as you wish or use heads from other ranges. The weapons are separate but mostly consist of just the forward half of the weapon along with a molded on hand so you can’t swap weapons between figures. The only problem with the minis are that they are actually larger than the Secrets of the Third Reich line of minis. As you can see in this comparison photo the MI-13 troops are a good half- to full-head taller than the SOTR troops. The heads are about the same size. Of course if the troops are not right next to each other this height difference may not be that noticeable, but we were hoping to bulk out some custom Incursion scenarios with SOTR troops and now we are not so sure. The MI-13 heads also seem to maybe be a touch small for the figures but since they don’t have helmets maybe this is more of an illusion. But in the pure Incursion world the MI-13 troops are a great new addition to the game, and Grindhouse continues its reputation for quality figures. Hopefully we’ll see some U.S. Rangers soon. On a separate note we also picked up some of the resin doors. They are what you would expect…resin doors. They are well cast but nothing particularly exciting — once painted up should they should look nice. They will need a small stand attached to keep them from falling over. 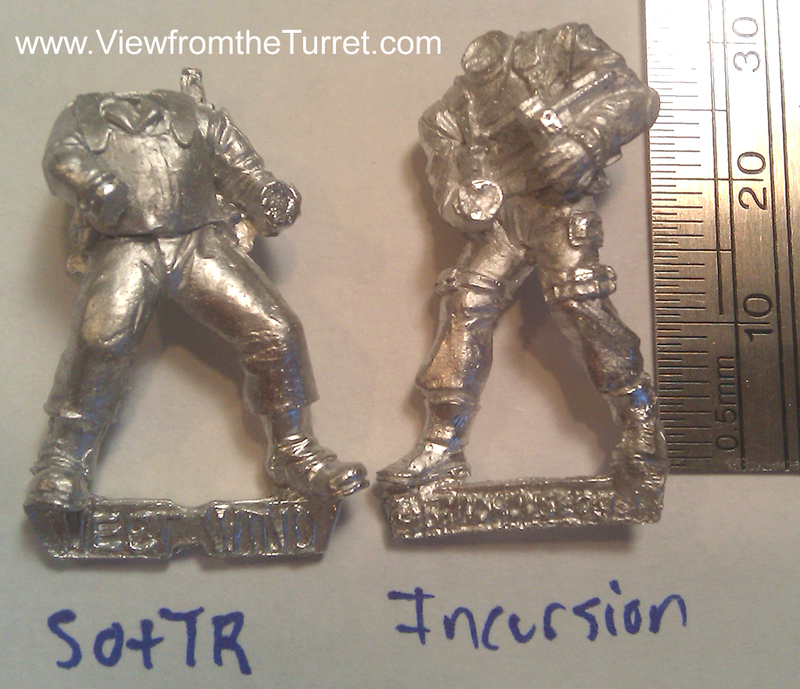 Also see our review of the Grunt APE miniatures for Incursion.